Blackeyed Susan, photographed at J.W. Corbett Wildlife Management Area, North Entrance, Loxahatchee, Palm Beach County, in July 2015. This might be the quintessential American wildflower. 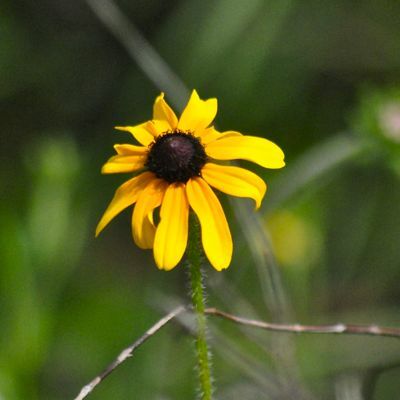 Blackeyed Susans, Rudbeckia hirta, can be found as a native in almost every state in the lower 48, commonly seen growing along highways and in fields across the continent. As horseracing fans know, it is the state flower of Maryland, the official flower of the Preakness, has a race named after it (the Maryland leg of the filly Triple Crown) and has a drink named after it (official drink of the Preakness). It's found in nine Canadian provinces and Mexico. It's been exported to Europe as an ornamental, where it has gained a foothold in the wilds of the Old World. 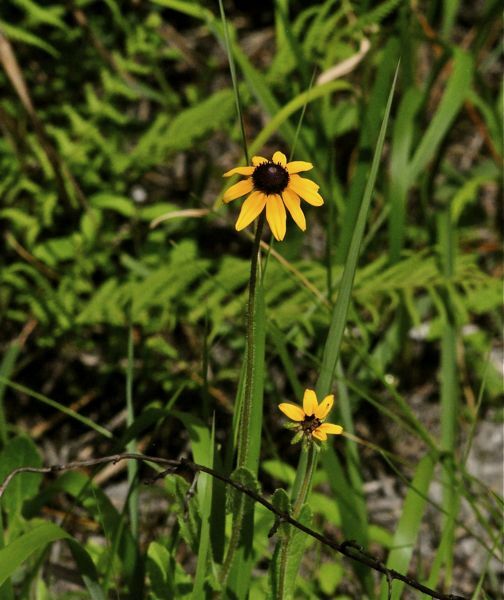 Blackeyed Susans are native to Florida, found in most counties. There's even a variety of blackeyed Susans named after the Sunshine State, Floridanna. While they are so common in some places that they are considered a borderline weed, they are rare in South Florida, according to the Institute for Regional Conservation. They grow in moist to seasonally wet pinelands, flowering in the heat and storms of summer in places most sane folk aren't likely to visit. They are biennials, or short-lived perennials. The first year, they produce a low-lying rosette of leaves. The second year, they can shoot up to 40 inches tall, sending out their trademark yellow-orange flowers with the brown eye. The stems are hairy, as shown in the photos above and below. 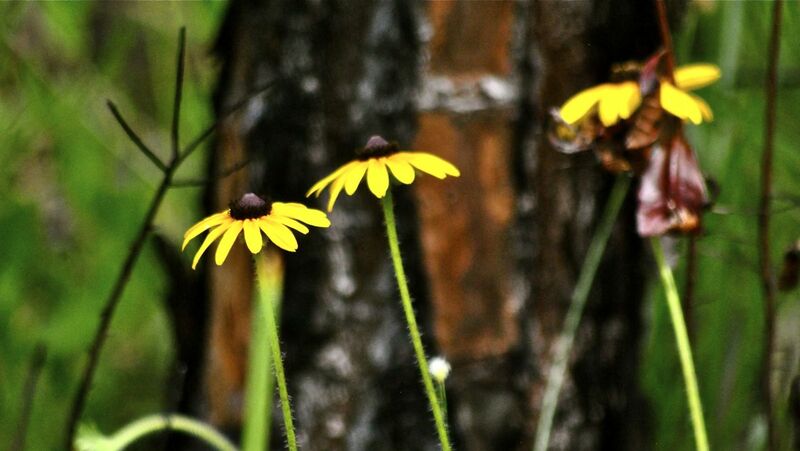 Blackeyed Susans are a pioneer species, meaning they're one of the first plants to recolonize an area that's been cleared by a fire or other disturbances. They are also tough plants, surviving, thriving even, in nutrient-poor soils with minimal care. These traits have made them popular for restoring tall grass prairies in the midwest, rehabilitating strip-mine sites and beautifying highways. They're also popular choices for wildflower gardens. Native Americans made use of blackeyed Susan as a medicine. The Cherokee used it to treat snake bites, ear aches and venereal disease. The Iroquois used it as a heart medicine and to treat worms. The Seminoles used it for headaches and to break fevers. The scientific name for the genus, Rudbeckia, honors Swedish scientists Olof (Olaus) Rudbeck, father and son. The Rudbecks happened to be teachers of Carl (Carolus) Linneaus, who described the plants and who also created the genus-species (binomial) system used to give plants their scientific name. Blackeyed Susan is a member of Asteraceae, the sunflower family. Other common names include black-eyed Susan, common black-eyed Susan, brown-eyed Susan, gloriosa daisy and yellow oxeye daisy.